Members of the Host Committee, Georgetown BID and Vital Voices gather at a preview event for F.N.O. 2012. Left to right: Walter Grio, Alyse Nelson, Kate Michael, Holly Thomas, Nancy Miyahira, Kelly Collis, Jeff Dufour, Lynda Erkeletian, Svetlana Legetic, Marissa Schneider, Samy K, Aba Kwawu, Marie Coleman, Rachel Cothran (Photo courtesy of Tony Brown/Imijination Photography). Shoppers, clear your schedules for Thursday, September 6: there’s a lot to look forward to at this year’s Fashion’s Night Out in Washington. Now in its sixth year, F.N.O. is a worldwide celebration that rings in the fall season with fashion-related events, shopping deals and celebrity appearances. Boutiques and stores are organizing events across the city but the center of the party is always the famous shopping destinations along M Street in Georgetown. The Georgetown Business Improvement District (BID) has been working hard to ensure that M Street’s offerings don’t disappoint. 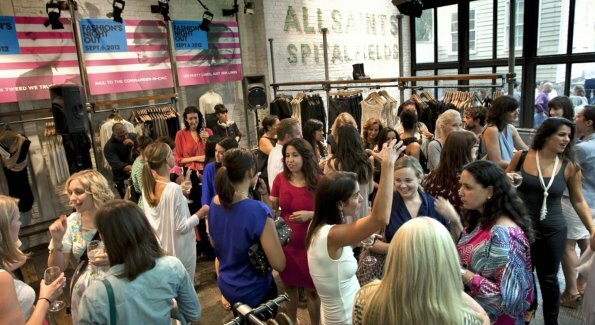 A month prior to F.N.O., guests from Washington’s most fashionable stores and media gathered in the loft-like upstairs of All Saints Spitalfields for a preview soiree to hear what’s in store for 2012. This year’s highlights include a DC Scout styling and shopping party at CUSP, complimentary facials at Kiehl’s, an Instagram Style contest at BCBG Georgetown, as well as blowouts and a lipstick bar thanks to Nectar Skin Bar and IPSA Hair Salon. DJs from ESL Music and Fatback are lined up to play at the BrightestYoungThings (BYT) lounge at Dean & DeLuca and at a new outdoor pop-up dance floor in the PNC bank lot. Guests can sample Bandolero’s The Devil Wears Prada cocktail and Morton’s The Steakhouse’s Black Tie cocktail, both created specially for the night. Media and guests mingle at a Georgetown BID preview event for Fashion's Night Out 2012 (Photo courtesy of Tony Brown/Imijination Photography). This is Georgetown BID’s third time hosting F.N.O. Proceeds from this year’s celebration are set to benefit Vital Voices, an NGO started in 1997 by then-first lady Hillary Clinton and former Secretary of State Madeleine Albright to promote the advancement of women. One hundred percent of the purchase of a $15 signature FNO Georgetown T-shirt or a $10 tote bag on sale at the Dean & DeLuca/BYT Lounge aims to support Vital Voices’ mission. BYT and Goodwill are also planning a pre-F.N.O. clothing drive on the two weekends before Sept. 6th with drop-off locations at participating Georgetown retailers. Clean out your closets for fall, check the F.N.O. website for updates, and prepare for an exciting evening of shopping for a good cause. F.N.O. Georgetown will take place on Thursday, September 6, from 6-11 p.m. Events will take place along M Street and Wisconsin Avenue. Follow the action at the F.N.O. website, Facebook page and Twitter (@FNOgeorgetown).